In the mid-1960s, there were no Belgians attending Belgium’s oldest university. Founded in 1425, the institution—known in French as the Université catholique de Louvain and in Dutch as the Katholieke Universiteit te Leuven—was no longer viable despite its rich legacy, and its national symbolic value. As in many places in the country, French speakers, known as Walloons, had long enjoyed special status at the institution, controlling its administration despite Leuven’s location in the Dutch-speaking region of Flanders. Fed up, the Flemish students demanded that the university rectify historic inequities and finally prioritize its Dutch-speaking majority. The institution had torn apart at its factional seams, and nothing less than a split down the middle would suffice. This division would ultimately require the construction of a new town, Louvain-la-Neuve (literally “New Leuven” in French) and a new campus just across the border, only about 40 minutes’ drive away. But dividing the library’s collection—splitting an expression of a unified culture, a shared history—may have been harder than building a new city. And so, in the 1970s, as Wallonia’s new Université catholique de Louvain (UCLouvain) was under construction, Leuven’s library was a house divided. While the Walloons waited for their new library to be completed, this historic building near the center of Belgium—about 18 miles from the border separating Flanders and Wallonia—now temporarily housed two distinct libraries serving two distinct institutions, one for each linguistic community. Students, faculty, and staff were “working in the same place, but not working together,” says Charles-Henri Nyns, now UCLouvain’s Chief Librarian, and a student in Leuven during the 1970s, when the split was underway. Staff members were instructed, he says, to assist students in one language only and not the other—to not answer students who approached them in the wrong language. All that determined which language you used was whether fortune had named you a Fleming or a Walloon; accordingly, books were split between the two institutions based not on their language, or their subject matter, but largely on their own labels—their shelfmarks. How else to split a collection that held more than just books, but the weight of the past itself? Some of that history was proud: Erasmus had found an intellectual home in the city during the 16th century, and the library held his letters. The building catalogued the Low Countries’ contributions to the arts and sciences, documenting intellectual movements, such as Dutch Humanism and Jansenism. In a country known for its lack of a cohesive national identity, the library seemed as close to a symbol of unity—of Belgian-ness—as could be found. The town became a convenient piece of propaganda for the forces unified against Germany. In England, Derez writes, some ships and even baby girls born in 1914 were named after the town, as “Louvain! shall be our Battle Cry” became the name of a military march. The burnt library in particular was so poignant, writes Derez, because no one could have justified its military value. Its image helped recast the war from “a political-military conflict” into “a clash of civilizations,” in which one side would destroy cultural relics in fits of wanton, nihilistic aggression. When the episcopate had taken control of the university in 1834, following the establishment of the Kingdom of Belgium, instruction and administration were made almost exclusively French, despite the university’s location in Dutch-speaking Flanders. (The one exception was a course in Flemish literature.) Feeling as though they were invisible, the Flemings “perceived their French-speaking colleagues as aristocratic, snobbish, patronizing, and condescending bourgeois, who remained convinced of the superiority of the French language and therefore refused to learn Dutch,” writes Louis Vos, an historian at KU Leuven. The institution did not begin to add more Dutch courses until 1911, following decades of Flemish nationalist activism. By 1936, the university had expanded to include a fully Dutch track for students, but the expansion only segregated the two language groups—rendering them separate, and decidedly unequal. When Vos was attending the university in the 1960s, he says the same lecture hall would host the same course two periods in a row: one session for each language. Students would ignore each other completely as they shuffled in and out. As the split was underway during the 1970s, says Nyns, the Walloon community was “like a ghetto”; he was able to make some Flemish friends, but only through proactive effort. Vos, meanwhile, says he never once conversed directly with a French speaker during his time as a student in Leuven. “The idea that Belgium is a bilingual state is not completely correct,” Vos says. The situation is closer to one of “self-chosen apartheid” based on “real hostility”—and carried out, of course, unequally. He recalls Francophone students getting to use nice laboratories while Flemish students were relegated to the basement, studying the sciences on a smaller budget despite making up more of the student body. The administrators eventually settled on some arbitrary ground rules, which seemed fairest under the circumstances. If a work’s donor could be contacted, the donor could choose where it would go—and if there was more than one version of the same work, each institution would be guaranteed at least one copy. But the majority of works were just divided by shelfmark: Odds stayed in Leuven, evens left for Louvain-la-Neuve. It was an oddly prosaic solution to a fundamentally emotional conflict. Along with Walloon students and faculty—who, Nyns remembers, “lost their homes”—the books moved across the border, populating this new prop college town that was then, according to Vos, nothing but open fields. Today, the two institutions enjoy a peaceful relationship, occasionally convening for ceremonies, and routinely collaborating on research. 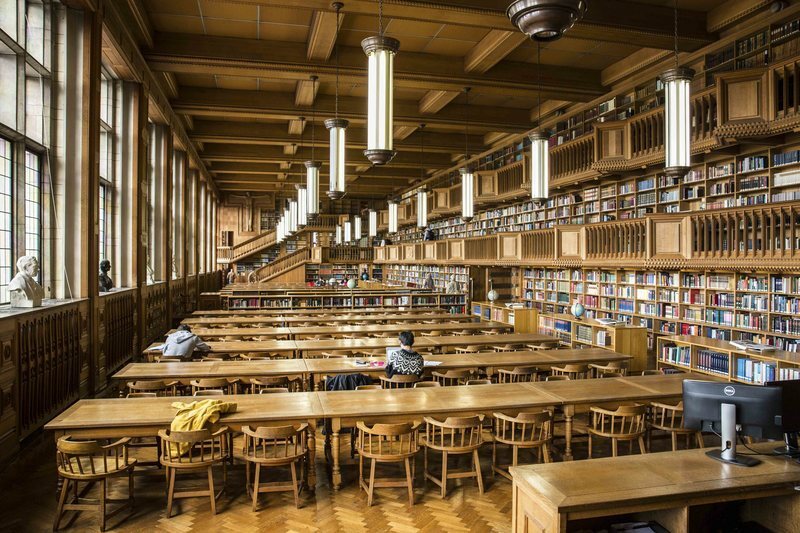 Law students, adds Nyns, often spend six months at the other school, as many Belgian lawyers are expected to be bilingual. But it’s a cold peace. The current students on either side of the border rarely speak one another’s language, and Walloons and Flemings often have to communicate with each other in English, says Derez. (He adds that Belgium’s German-speaking minority—less than one percent of the population—are known as “the last Belgians,” caught between the country’s two distinct factions.) He wonders if the partnership between the two institutions will evaporate within the next few generations, when there will be no one left to link the two groups. Perhaps then—in the absence of a unified Belgium—the split will seem even more, as Derez insists, like “a typical Belgian solution” after all. *Correction: This story originally said the prayer book had been hidden in a bathroom. It was a bedroom.